Truth is, be careful what you ask of me, assign me, challenge me or give me. These two hands splayed before me can do anything. Disclaimer: Except knit. It’s a crazy thing. My cousin and I were both taught how to knit by our paternal Grandmother. My cousin is an award-winning, knitting camp attending (ok, show of hands, who knew knitting camp existed? ), master knitter who has photographs of her work published in knitting books. Me? I can knit. Scarves, just don’t count my stitches or expect any awards. To be fair, I am an award winning pie maker and this same cousin can’t make crust, even though we were both taught by the same woman, our Grandmother. Let’s call it a tie, I just want to be honest, I can do anything, just with varying degrees of accomplishment. Best believe, I will give whatever is presented before me my best effort. If I call it a scarf, accept it as a scarf. Give it to the cat if you hate it. As a corporate recruiter, in addition to regular every day career placements, my day job includes travelling to our US and Toronto offices and 15-17 universities throughout the year. At some point I tallied I travel 57 days a year. Manageable, and I get to meet great people and see some fantastic places too. Most of this travel happens in the spring. If you’ve kept up with the series, you will agree, this past spring was emotionally difficult. Pushed to my limits, I needed a big project, a big distraction to deal with my life, my emotions. 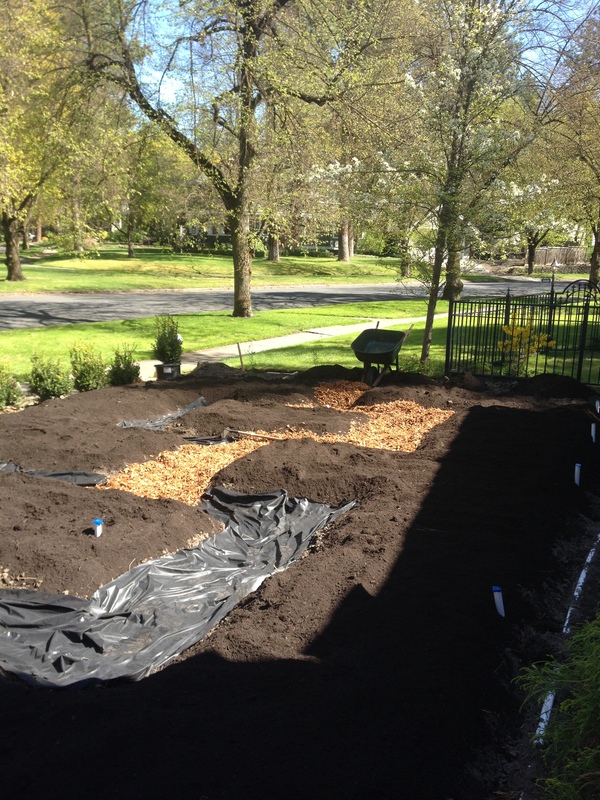 I’m not sure my husband was fully aware that I was serious when I asked if he had any thoughts or comments to my brilliant idea to ripping out half of our front yard and putting in a vegetable garden, but he agreed. He doesn’t like watering or mowing the lawn so he was happy to have less lawn. Excellent. 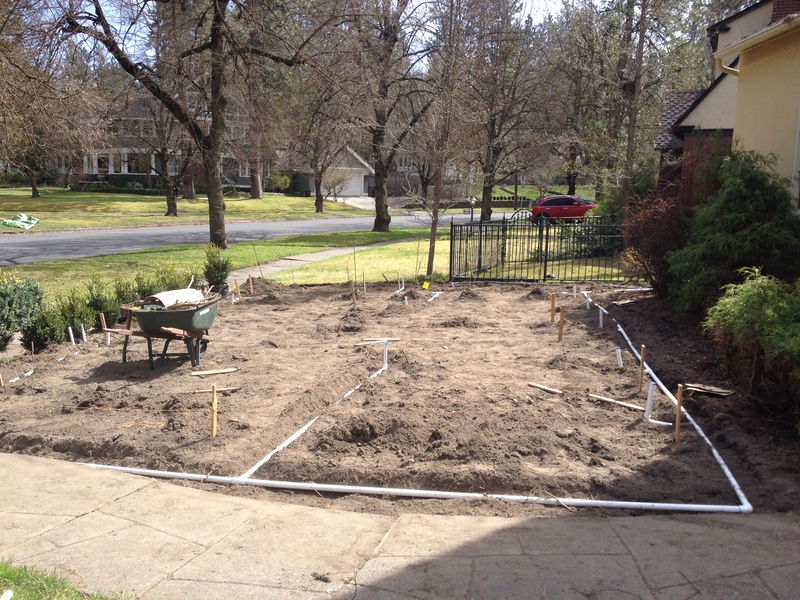 The catch was that he put me on a tight budget that allowed for irrigation and soil and seeds, but no labor. If I wanted this garden, I had to do it myself. 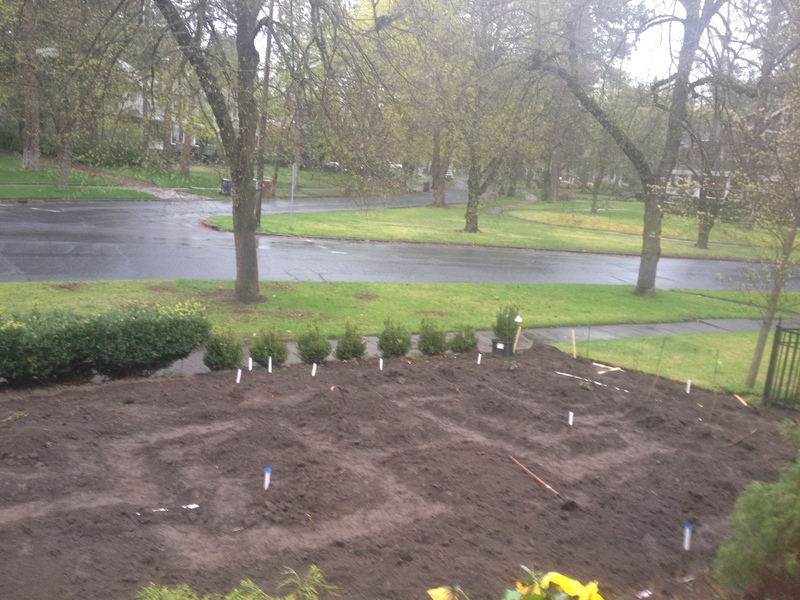 I called a contractor to get a quote to remove the sod. My husband laughed at the quote with a hearty, “No!” Being a kind hearted guy, my husband did buy me a new shovel. Yes, I have a husband, a daughter and three boys, but all quickly disconnected themselves with any garden responsibility. Think of The Little Red Hen story, I am The Little Red Hen. They know the story too, and helped just enough to say they did. My husband dutifully went on every Home Depot run and gave me instruction on how to cut, glue and fit PVC. 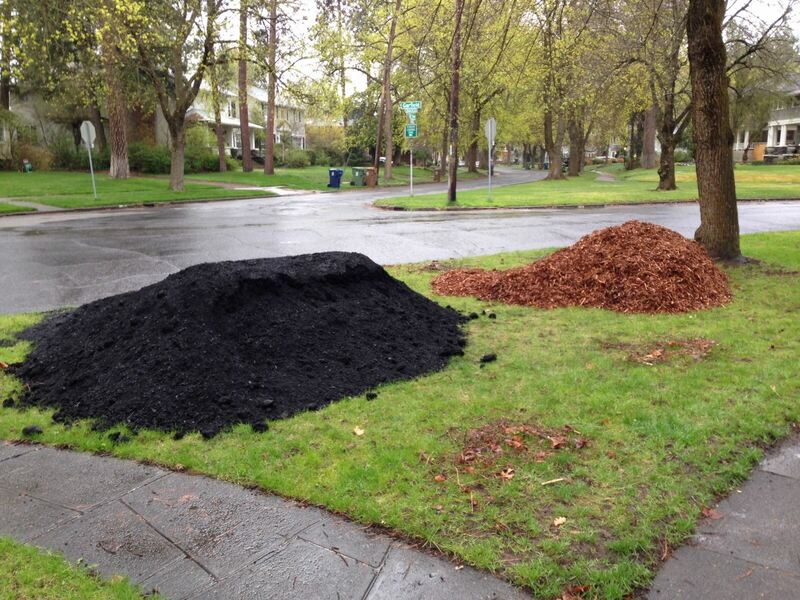 Yes, I dug sod, I went battleaxe on gigantic tree roots, I dug out the pattern and I moved all the compost and wood chips from the street to the garden. 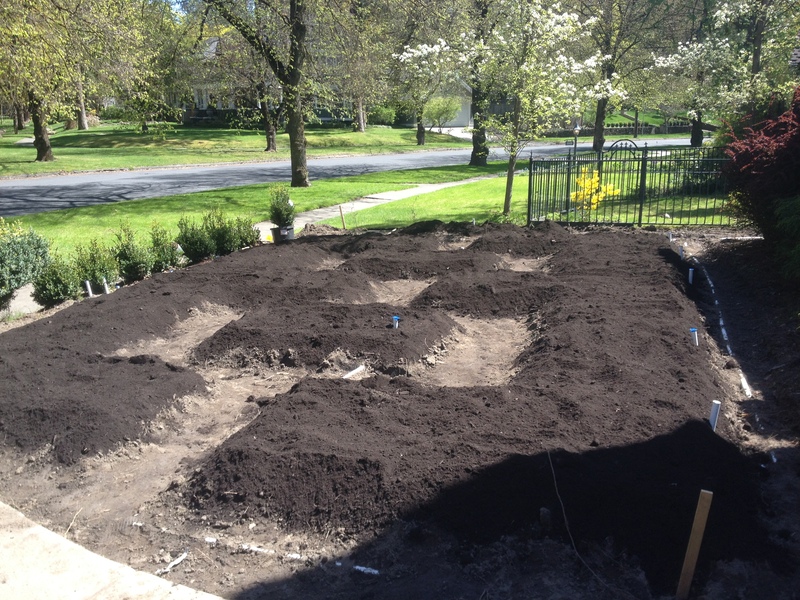 Five hundred square feet of sod removal is how I managed my stress, my workload, my sadness, my emotions, and my pain. My vision of my garden was my therapy. I ached. I hurt. I had blisters. I was filthy. I collapsed into bed and slept solidly every night. Exactly what I needed. My project proved Sponkanites to be a curious, opinionated bunch. No wonder I love it here, I fit right in! Everyone that passed by had a question or a comment on what I was doing, why I was doing it and what I should do differently. I met and conversed with so many, including the preschool chain gang that marches by every week on their walk around the neighborhood. 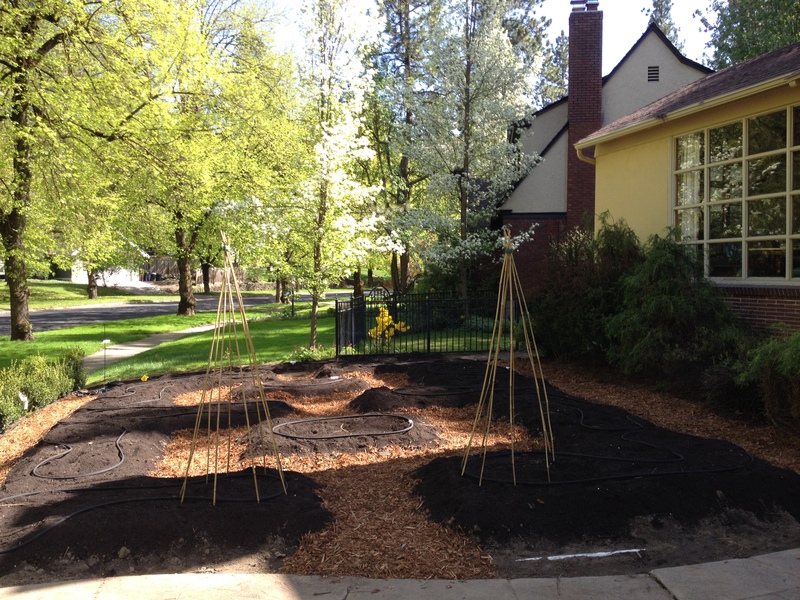 My design is an unframed raised bed in a keyhole pattern, providing twelve 4′ x 8′ beds. My kids say it looks like sunglasses. All of my previous gardens have been hidden in the back yard. This garden, located in the front yard, had to be more than some rows of dirt. The plants are growing, I just haven’t taken any pictures yet. We’ve eaten lettuces every night for weeks. I have red potatoes, artichokes, rainbow chard, cabbage, kohlrabi, romanesco broccoli, regular broccoli, cauliflower, kale, haricort vert, shelling peas and sweet peas, bush beans, fava beans, lima beans, zucchini, patty pan squash, cucumbers, pickling cucumbers, 7 kinds of tomatoes (10 plants total), tomatillos, sweet corn, pumpkins, jalapenos, red and gold sweet peppers, eggplant, popcorn, leeks, carrots, beets, arugula and mixed lettuces. I have yet to plant my radishes.